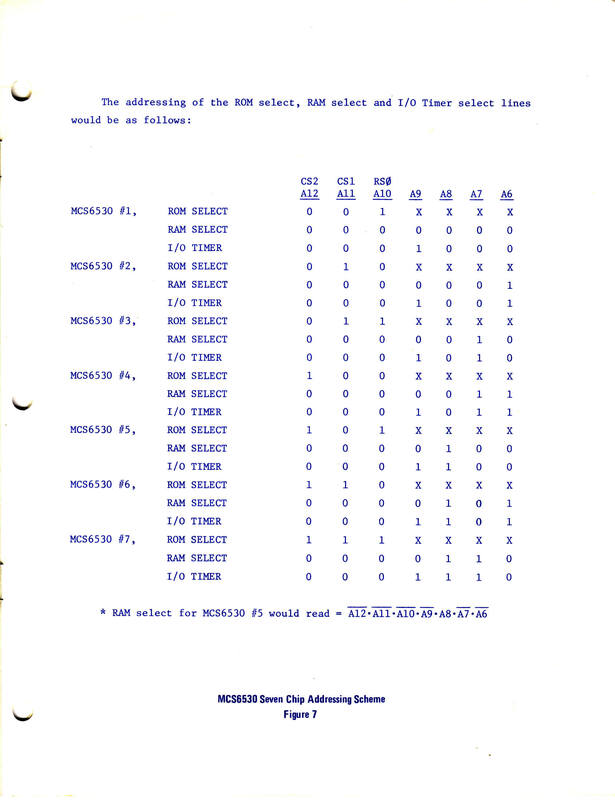 6500 Data Sheet. 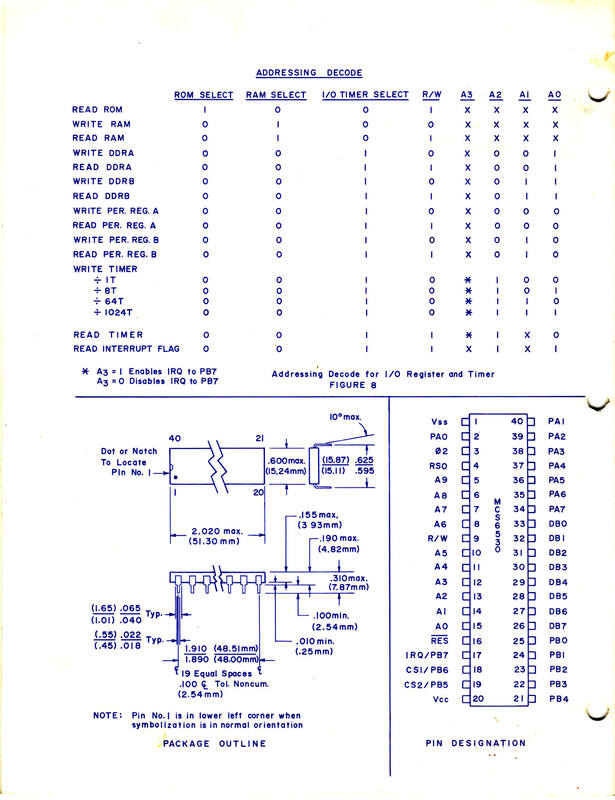 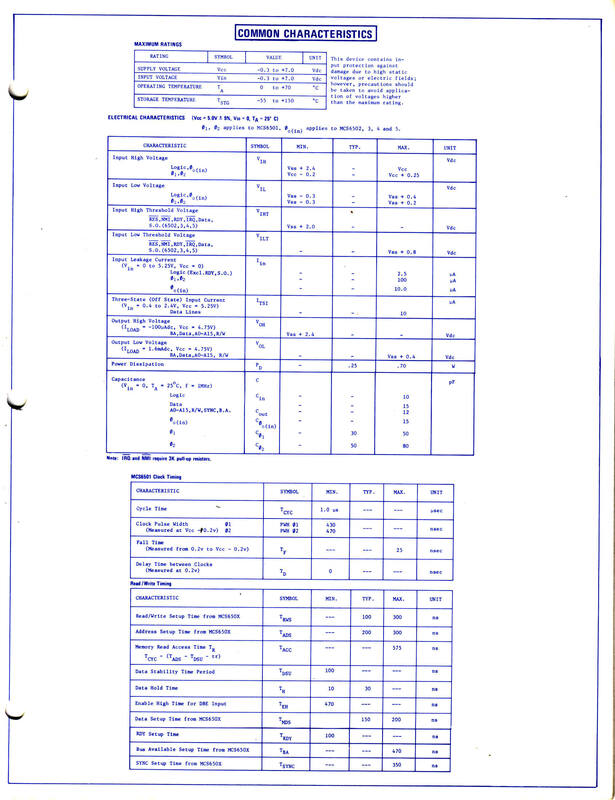 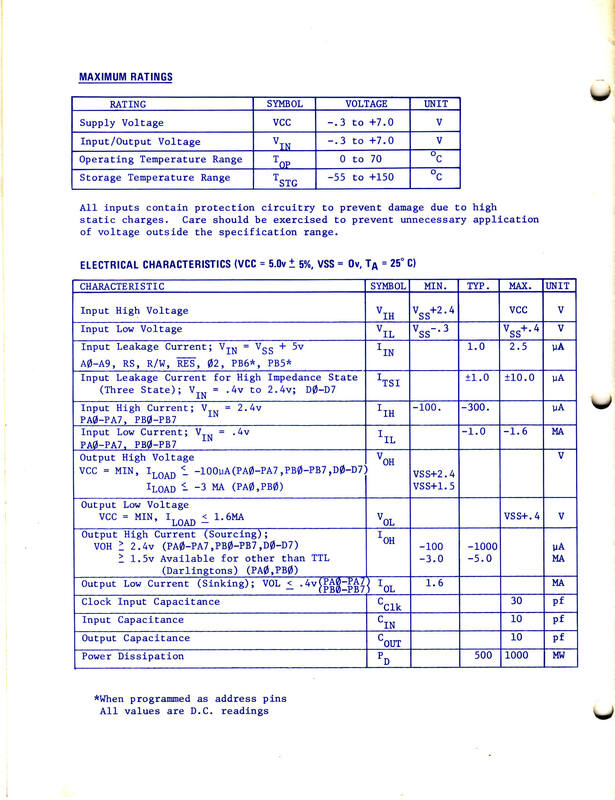 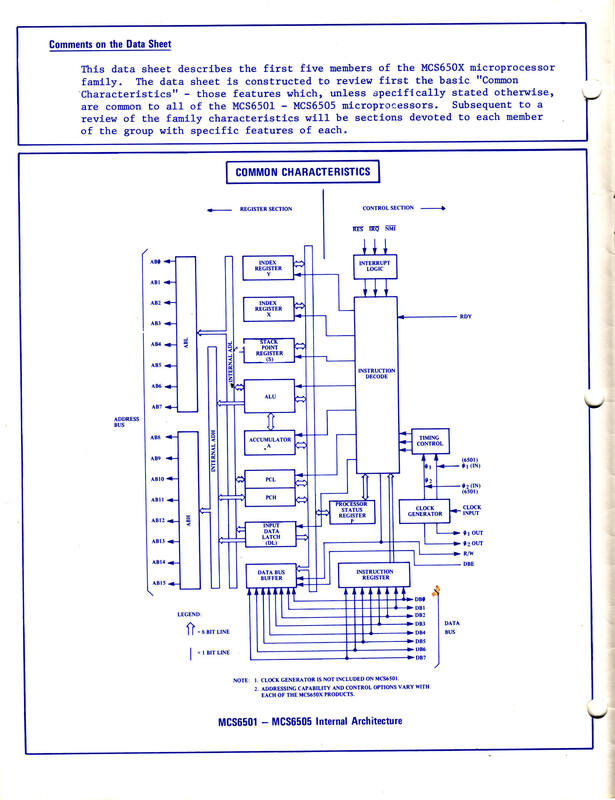 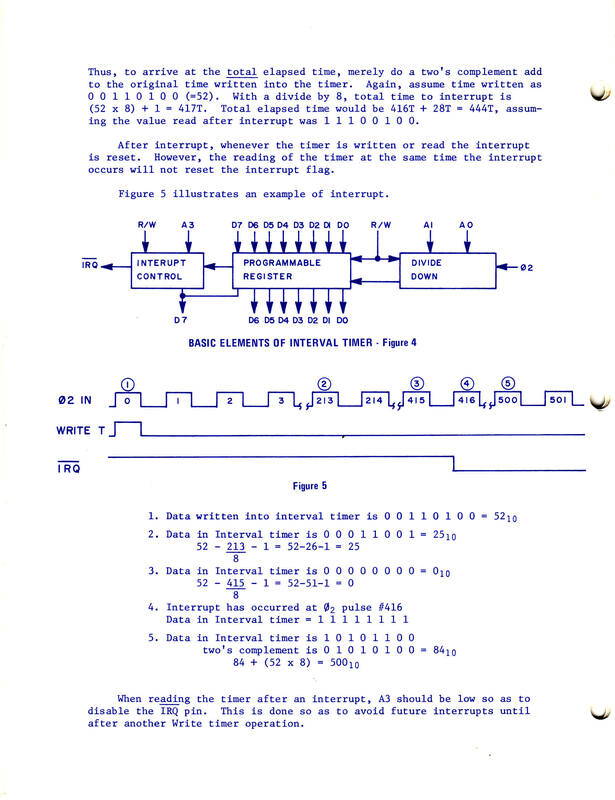 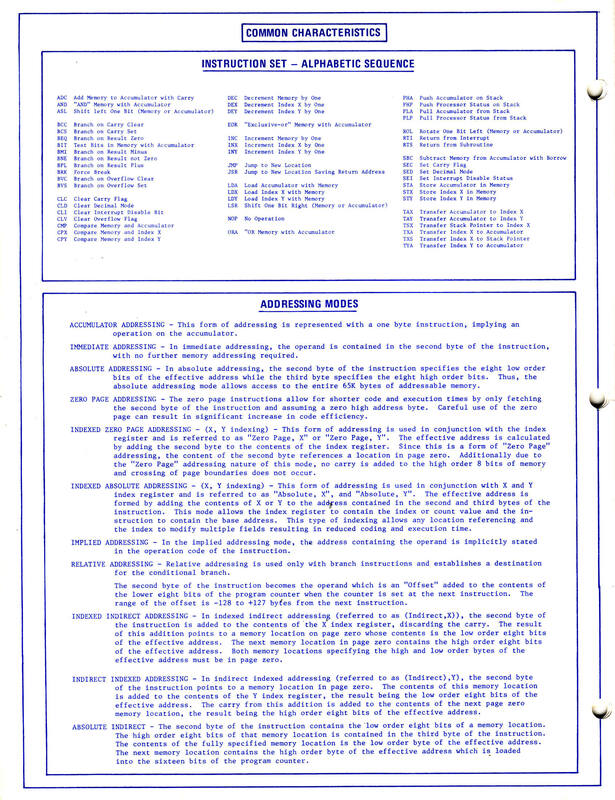 This is the original, MOS Technology "Preliminary Data Sheet" from August 1975. 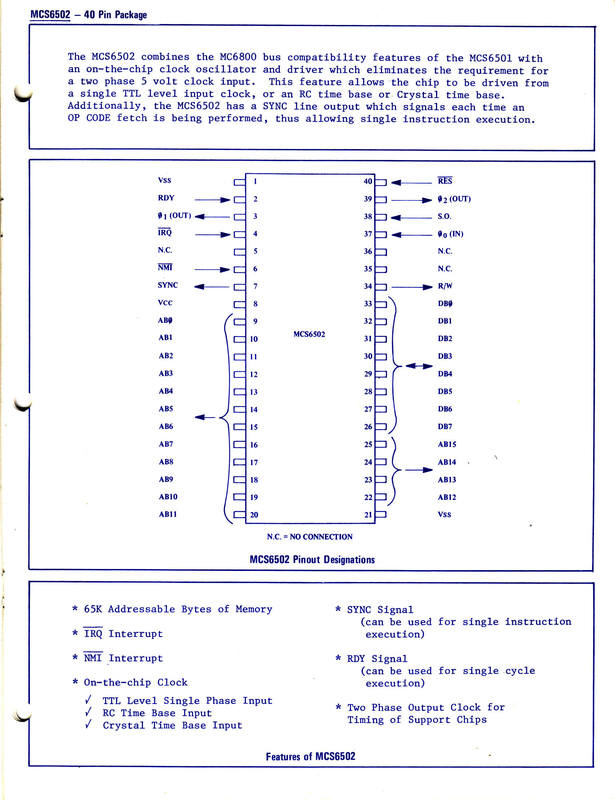 It includes the 6501, which was pin compatible with the Motorola 6800. 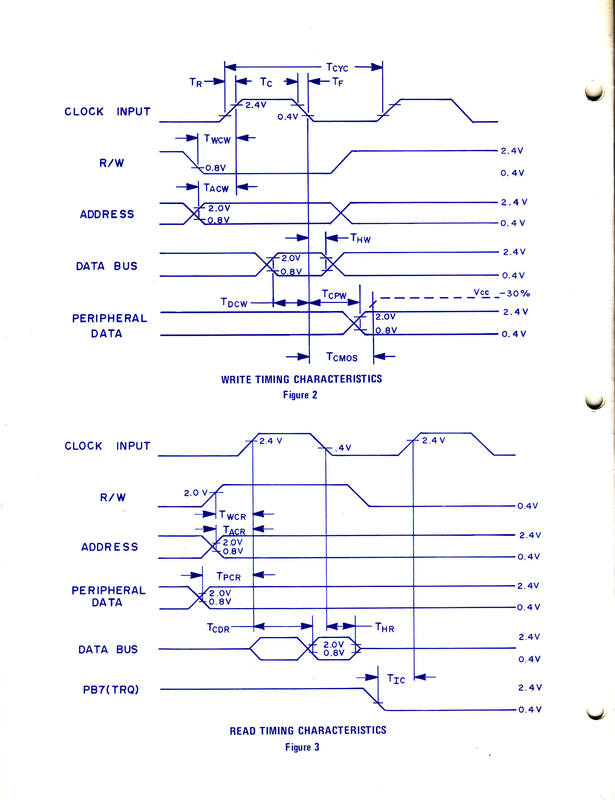 It also includes the 6502, 6503, 6504 and 6505. 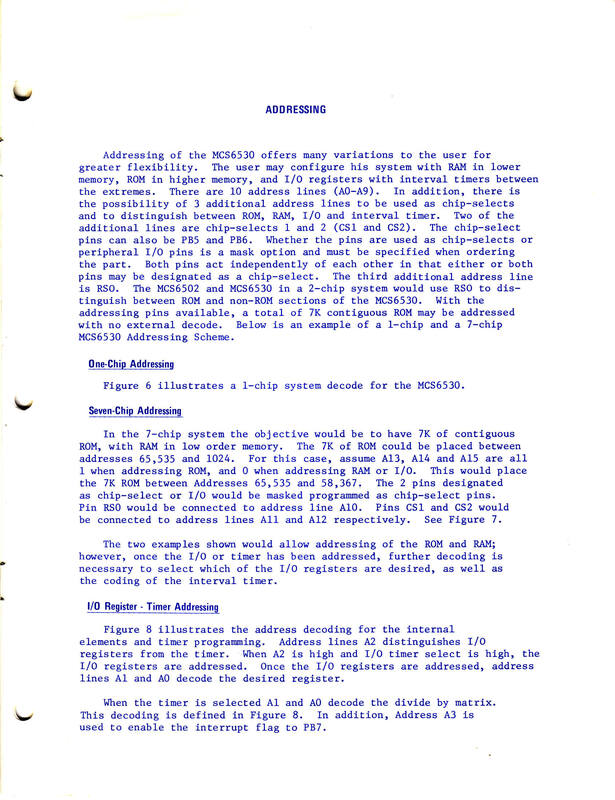 High Resolutions Scans for all 12 pages are included. 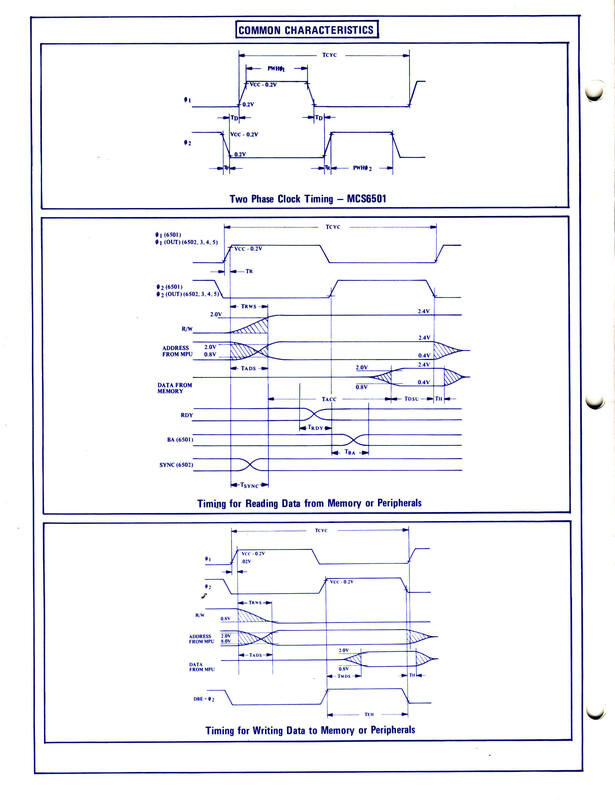 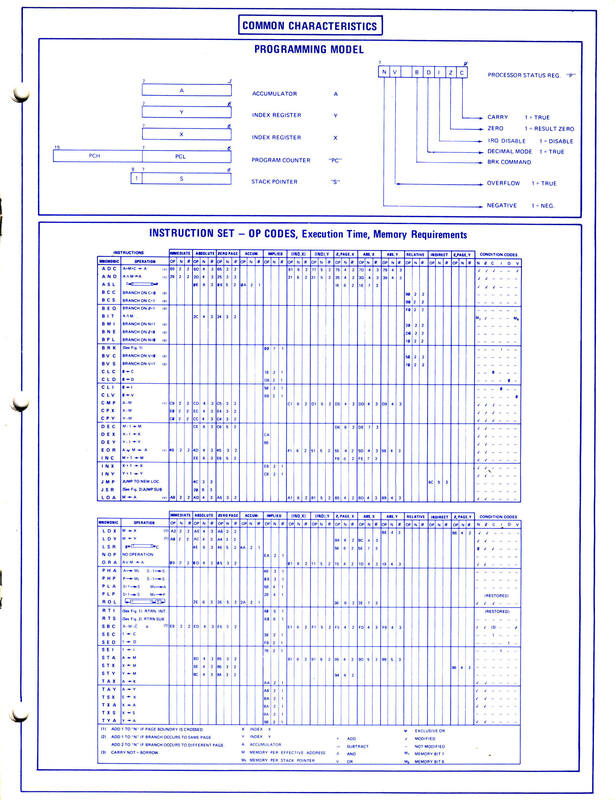 One of the interesting things about this data sheet is the fact that the 6501 was included. 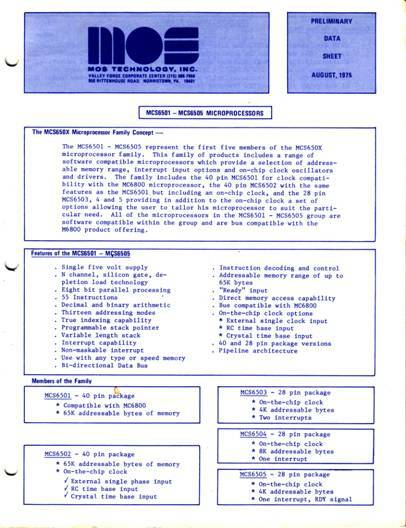 Since the 6501 was pin compatible with the 6800, Motorola sued MOS Technology. 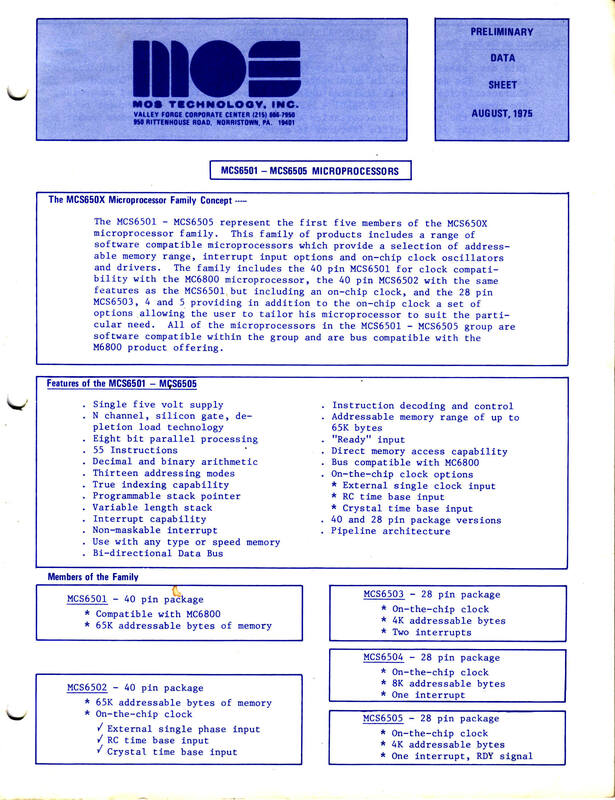 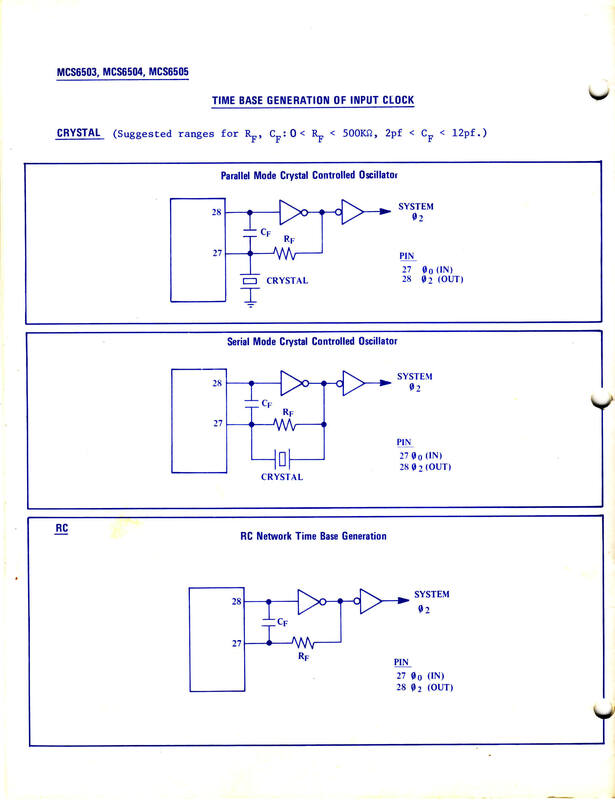 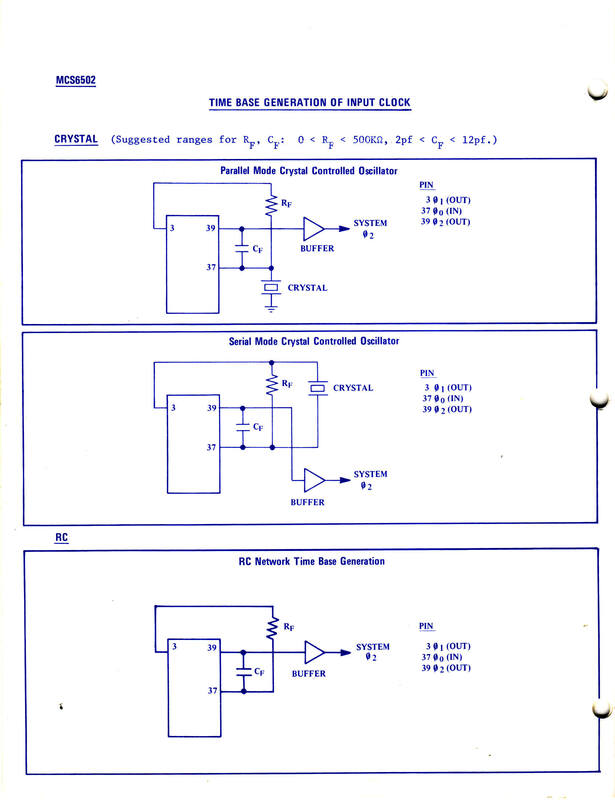 The suit was settled when MOS Technology agreed to drop the 6501 from its product line and only market the 6502. 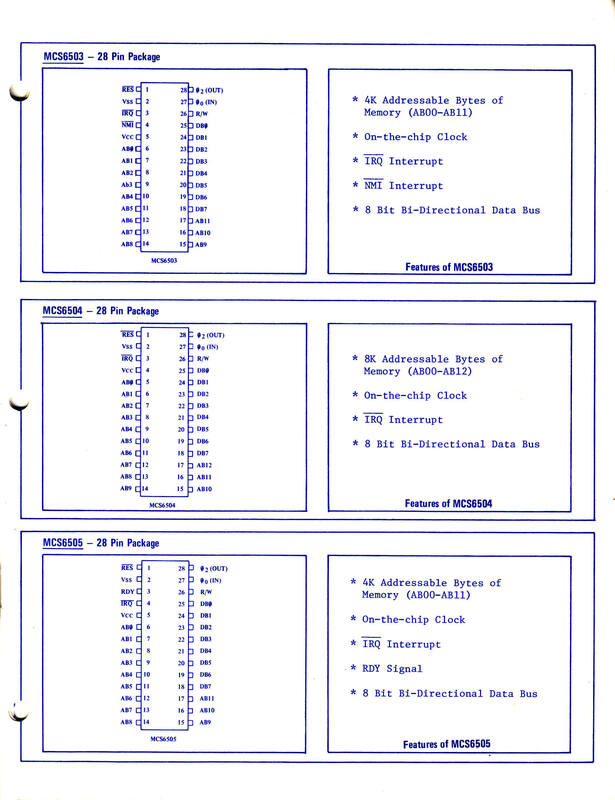 Many early computer builders were attracted to the 6502 because of its low price and the because had indirect and indexing modes, which were useful for developing high-languages. 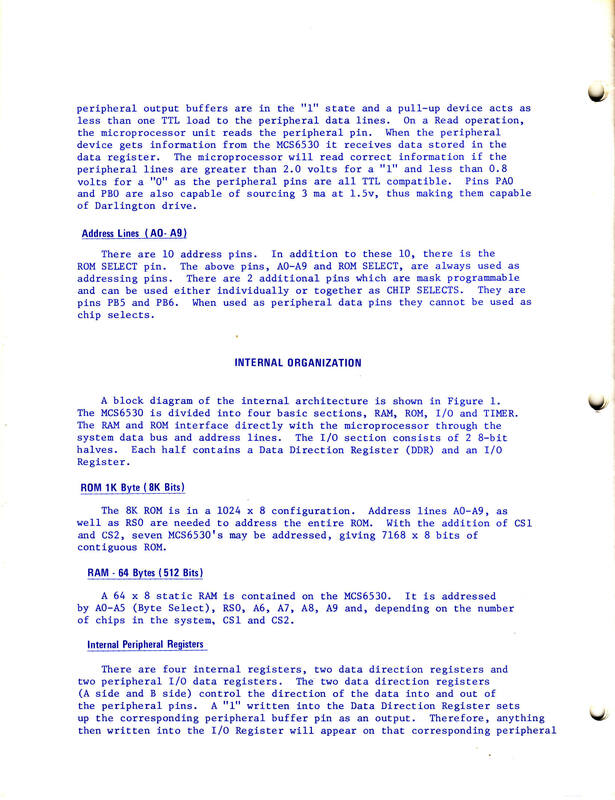 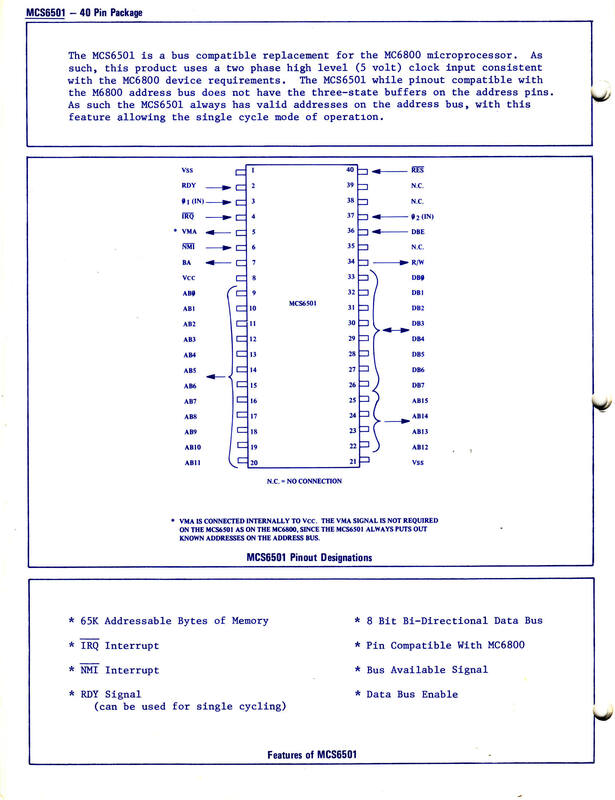 6530 Data Sheet. 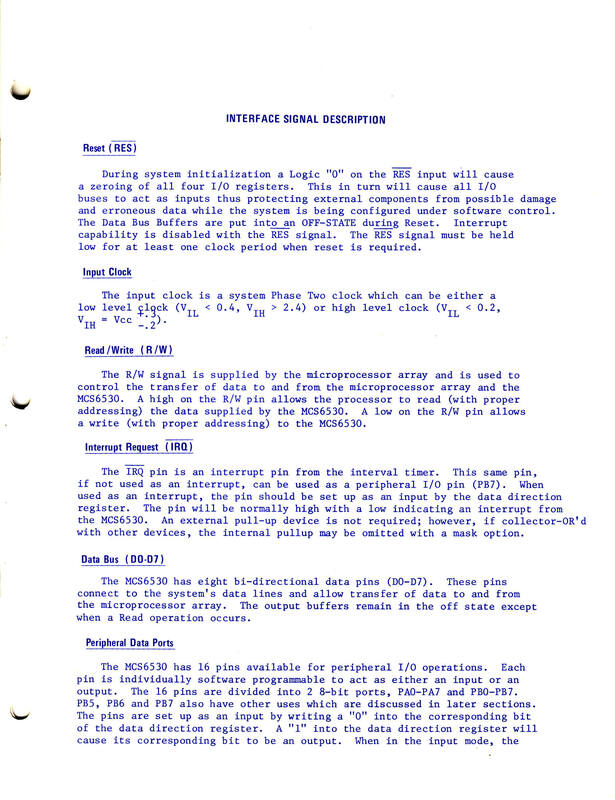 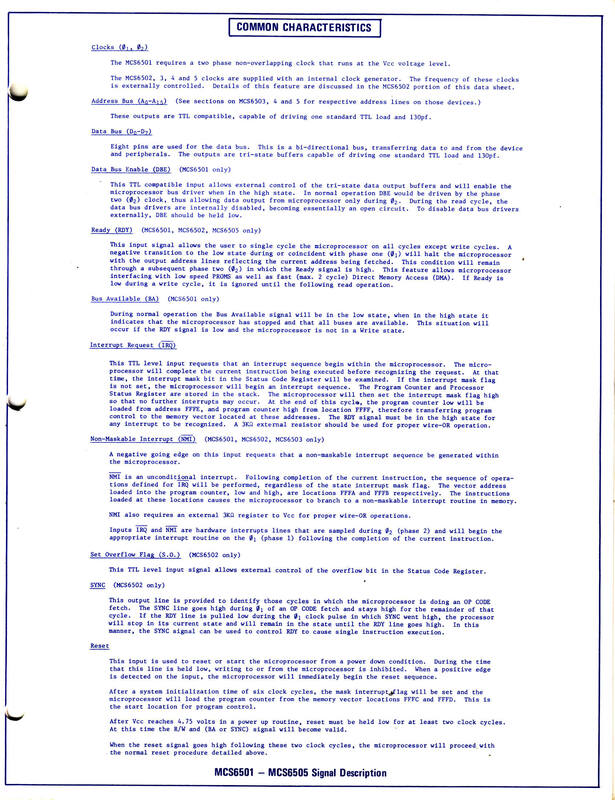 This is the original "Preliminary Data Sheet" from August 1975. 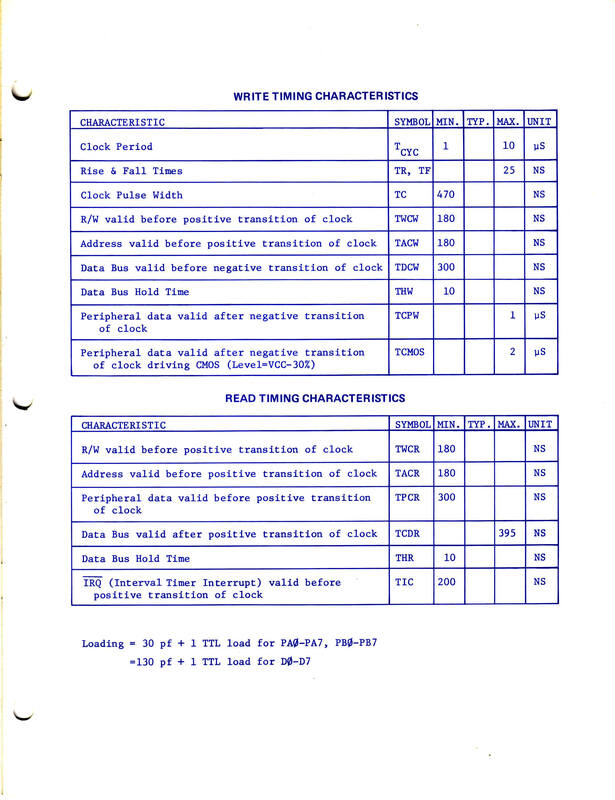 This chip had a mask-programmable ROM as well as an assortment of I/O channels and on chip timers. 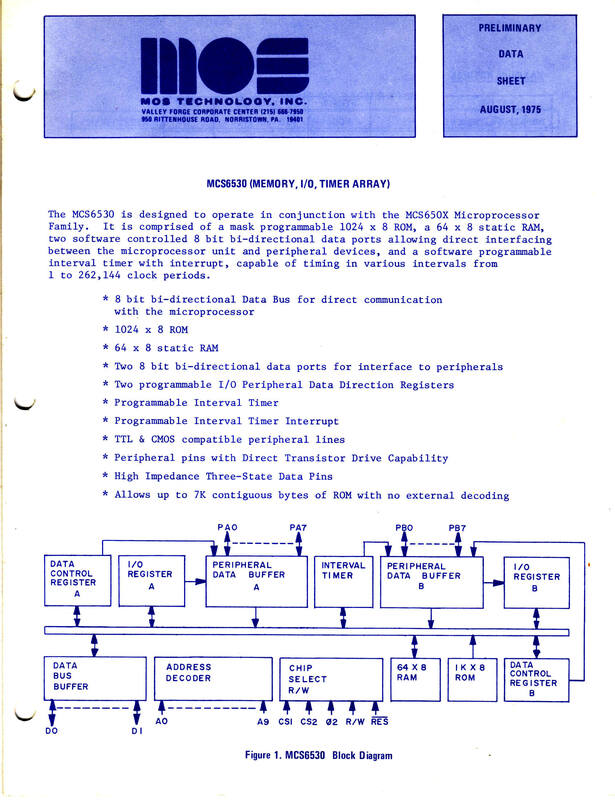 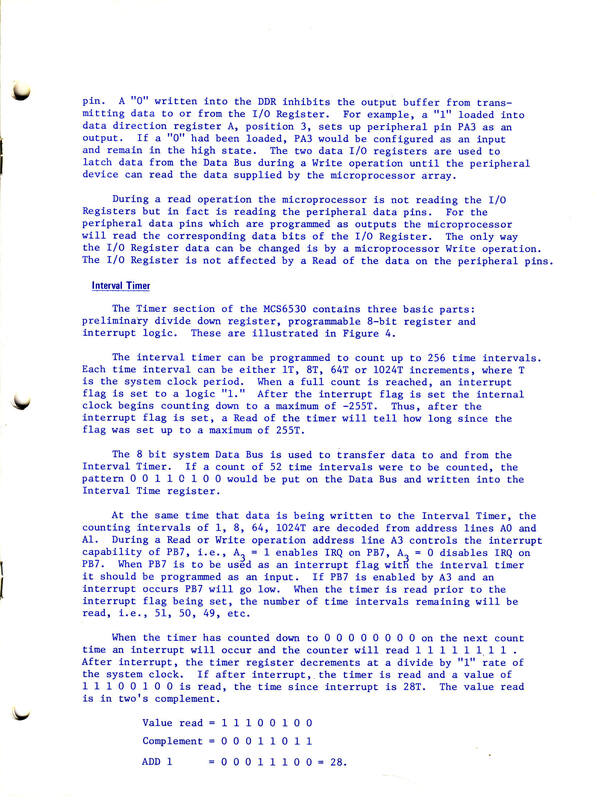 MOS Technology sold a special version of the Chip called a TIM, which contained an Assembly Language Monitor. 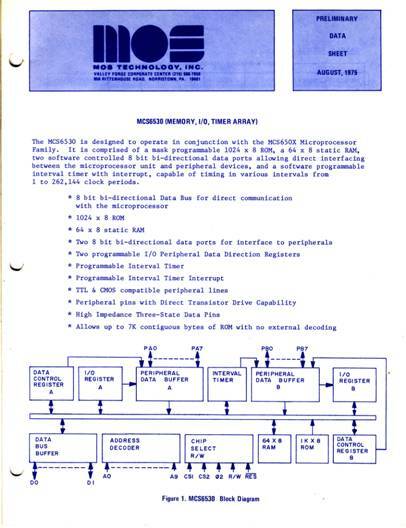 The Monitor could be used to examine and modify memory locations and run programs, replacing the ubiquitous, replacing toggle switches and lights, with a teletype giving a much more intuitive human interface. 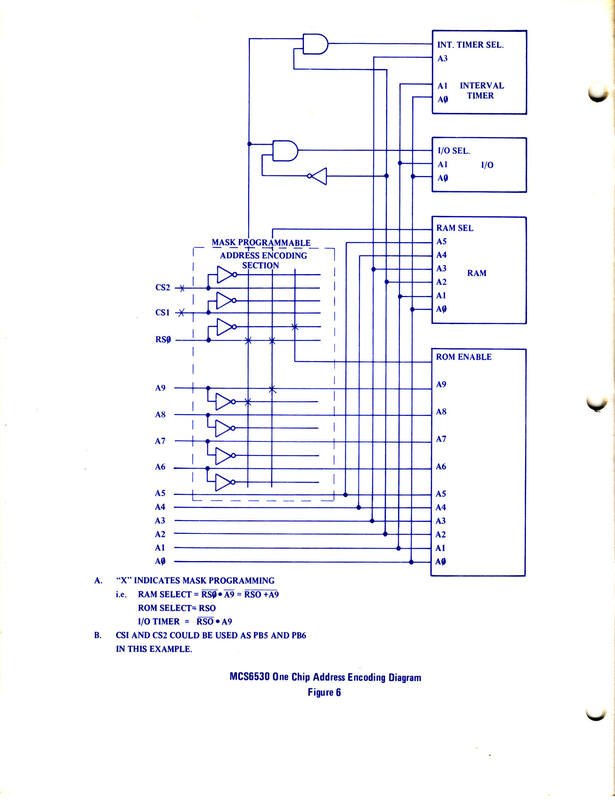 Since the 6530 didn't have a hardware UART, so the chip simulated it in software.